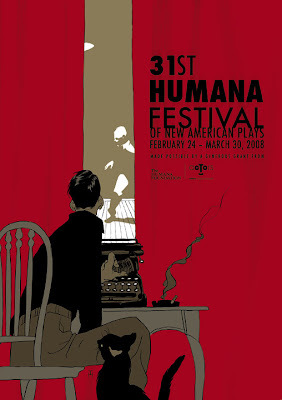 tomer :: the festival: The 32-year old Humana Festival is an internationally renowned showcase of stage premieres held each March. Many of the plays premiered in this celebrated annual event have had subsequent productions on Broadway, Off-Broadway, on film, TV and at regional theaters across the country. Three festival plays have won Pulitzers. job brief: There are usually around 8 full productions in the festival. But there is no attempt to make the poster art reflect these specific plays. Instead, the poster image usually has to do more generically with writers, the writer’s imagination, the tools they use or "words" themselves. Images of the human mind as well as images connected to the work of playwrights today have been used. Also seen have been images that create a feeling of the energy, impact and humanity of the stage or a live theatrical performance. 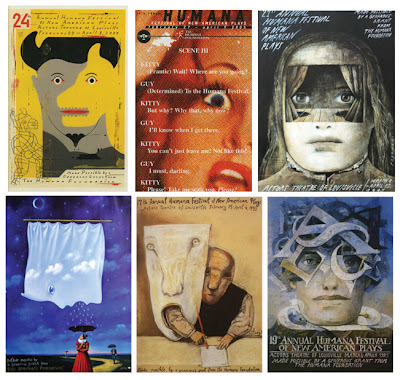 legacy: Brian Cronin, Chip Kidd, Wiktor Sadowski (3rd and 6th images), Rafal Oblinski, Stasys Eidrigevicius. (this is a partial sampler of my top favorites). awesome idea man! 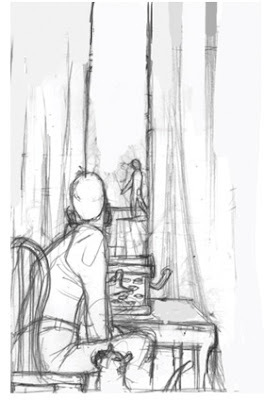 I like in the sketch you can see the fold of the curtain more but still the end product is great! In a word, Beautiful. I love how minimal the linework is and how much form that creates, even with the simple solid colours. I think the cat is a secret favourite part for me, the taper and the shape over the ear and the arch of the back. Any chance this is going to appear on Monomyth? Really nice execution. It's great to see illustration and type working so well together (which it does in a lot of your work ). that's a beautifully execution of a very clever concept. Wow, that's both clever and beautiful. I'm not sure it matters, but if I hadn't read the thing about the paper I'm not sure I would have interpreted the slit as such. None the less. This is really, really cool. You're such a master of solid blacks. I'm envious. Excellent job-- love the color choices. Good concept too. Excellent idea and crisp, efficient execution! Tomer, this is really incredible. 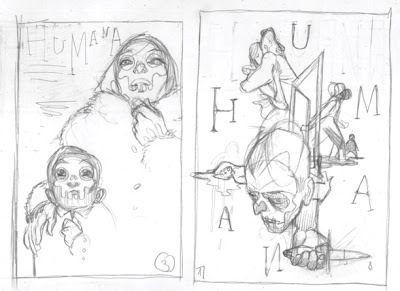 I am sensing a slight transition into a more graphic approach.....which I think is excellent. marvelous concept....great color....as always very inspiring. works really well, nice colors. ridiculously clever solution, very well done. line work, color, and draftsmanship is ace as always. did i mention that i love your work? very classy. I love it. we might have it later on on monomyth.com thanks fellas. I love this composition !